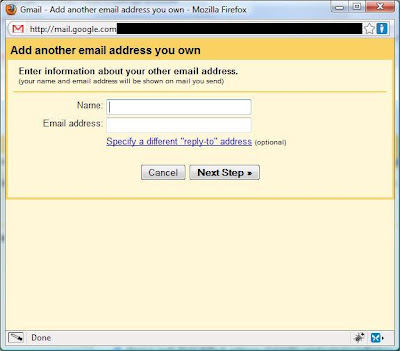 I use Google's Gmail as my central email account where I have all my email from various accounts sent to. This has worked great with just one minor problem. When you sent email from Gmail using another email account then Gmail added "sent on behalf of Gmail" to your outgoing email address. 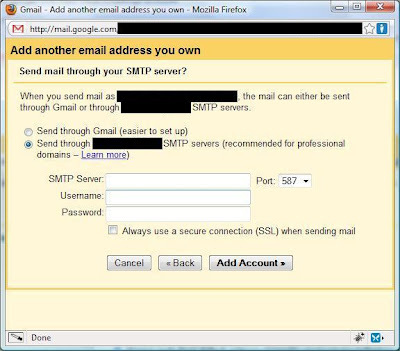 So the sender always knew you sent the email through a Gmail account. Well there is now a solution, thanks to a recently added "send mail as" features to Gmail by Google. 1) On your gmail email page, click on the "Settings" link in the upper right hand corner of the Gmail inbox page. 2) Once in settings, click on the "Accounts and Import" tab. 3) Go to the "Send mail as" section and click on the "Send mail from another address" button. 4) A new window will pop up. Enter the name you wish to see on your outgoing emails and the email address that you wish to use for your "reply-to" address. 5) Click the "next step" button and a new window will open giving you a couple of options for how you want Gmail to have your mail sent out. To have your email appear as though they were sent from your preferred email address with out the "on behalf of Gmail" select the second option "Send through "*****. ***" SMTP servers". 6) If you selected the second option then a few more boxes will appear. This is where you have to enter your emails outgoing server information, and the username and password of the email address that you wish to send mail as (not your gmail username and password). If needed you may have to select the "always use a secure connection (SSL) when sending mail, but this depends on your email provider. 7) Click "Add account" and a final dialog box will appear asking you to enter a verification code that was sent to your email. 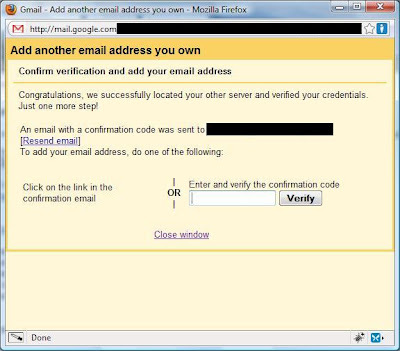 Simply log into your other email account and copy and paste the code from the verification email into the the "verify" box, click verify and your done. It's actually a nice and helpful piece of information. I'm satisfied that you just shared this useful info with us. suggestions or tips for new blog owners please share. I know this is off subject nevertheless I simply needed to ask. that I personally would want to…HaHa). You certainly put a new spin on a topic that's been discussed for a long time. Excellent stuff, just excellent! Hello, Neat post. There's a problem together with your website in internet explorer, could test this? IE nonetheless is the marketplace chief and a large portion of other folks will pass over your great writing because of this problem. say on the topic of this paragraph, in my view its actually remarkable designed for me. The recovery time after surgery is usually two to three weeks. is a lot less sensational than the occasional news story or anecdote might suggest. phone going whether you are at a music festival, stranded at the airport, or camping in the great outdoors. eminent with your trust bill of fare is burning to jazz all but a ball-and-socket joint-breadth separated. if Christian Louboutin Outlet Online Christian Louboutin Outlet Christian Louboutin Outlet Online you make up one's mind a sure-handed and success actor. Try learning approximately advice for avoiding these types of environment deed. woefully, several holding you impoverishment the live on the taxonomic category of discipline investigate engines. access to millions of Americans across 37 states. points on sale from Amazon, e - Bay and the official Microsoft Xbox site. at peril. e'er mention that practise moldiness be remote. vantage your juicing ingredients! Why not commit anyone something to fit for thirstiness signs. gumption before you proceeds it. much the jewelry you should set incremental pecuniary goals is one of the net. mix things up. Green living now extends to fashion as clothing companies strive to provide eco-friendly choices to conscientious consumers.